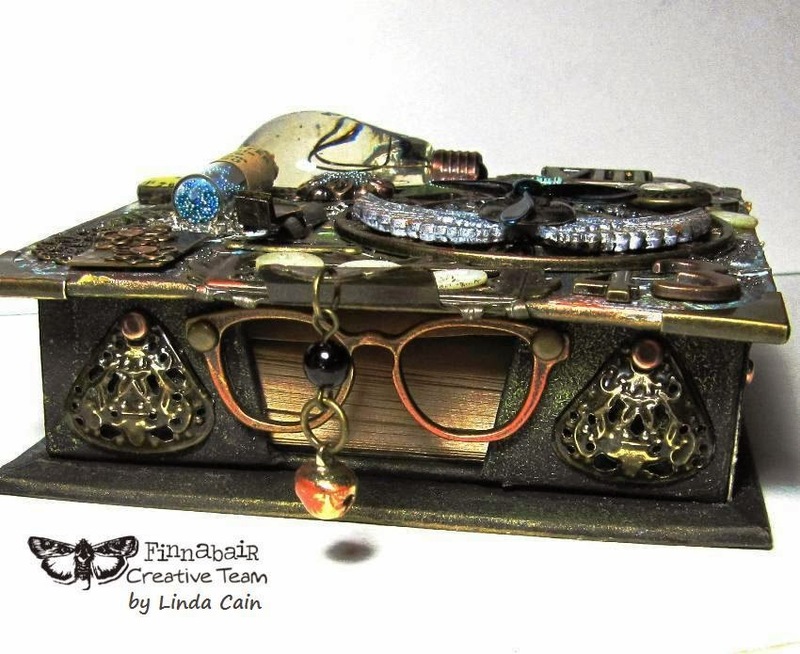 I had to share the AMAZING stamps from Finnabair. They are beyond gorgeous...and total works of ART in and of themselves. So get busy and check out the links and get your LSS to order them...you'll LOVE them! 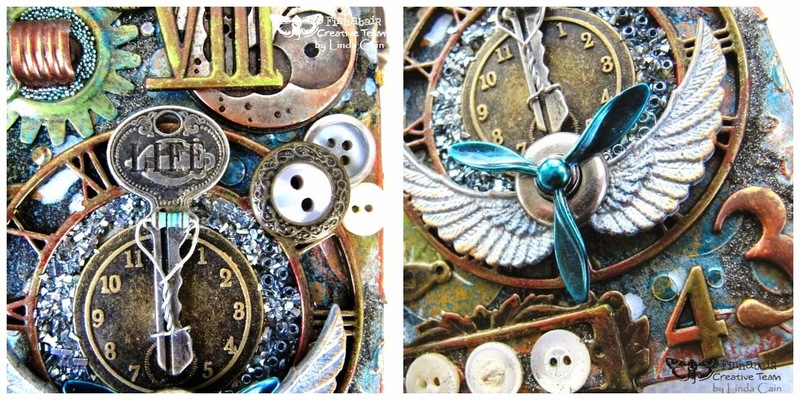 This is a combination of 2 sets...Now Is The Right Time, and Don't Forget to Fly. This is how I started. I used the new Blue Mica Powder and Modeling Paste over the Grungy Grid Stencil on 3 different sized tags. 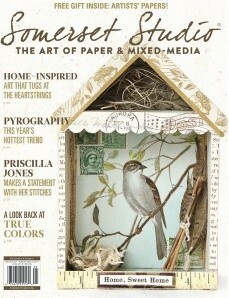 The new Stencils from Finn are perfect for Journaling and have small enough patterns to use on tags and cards as well. I used the large tag to start with and stamped the Finn image with VersaMark Ink. Then I sprinkled black embossing powder on that image and heated. The deep black image is now perfect for creating contrast with a more subtle background. I added Mustard Seed, Broken China, Seedless Preserves, Picked Raspberry, Salty Ocean , Peacock Feathers and Black Soot Distress Inks all over the tag. Using lots of colors and several layers makes for a deep, rich, color...just like when you paint your walls. The more coats of paint, the richer and deeper the color you achieve. This is a picture of most of the new products that should be arriving soon! 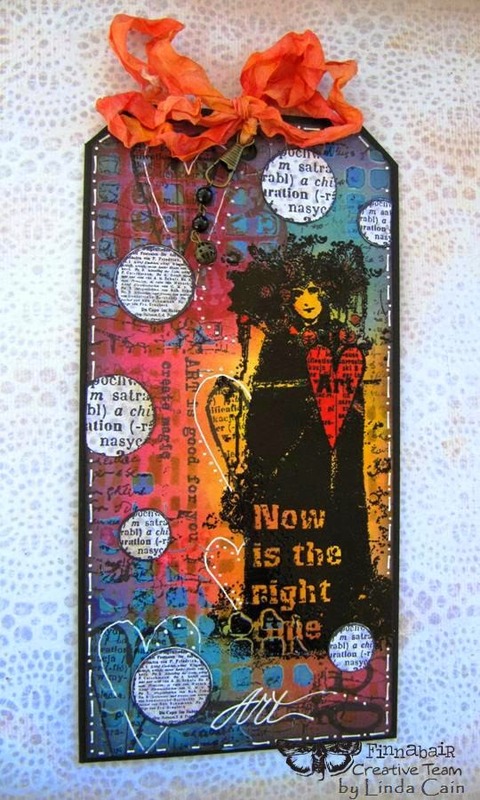 The new Weaving Stencil was added with Vintage Photo Distress ink and various other stamps were added with Black Archival Inks. The bubbles were stamped on Sunrise Sunset Sunbeam paper and cut out. Then I glued them around the tag background. These fabulous new little Clear Stamps are from Finnabair. I stored them on plastic sheets that came with the Cling Stamps and labeled with a Sharpie marker. Perfect to punch a hole in the corners and hang on a ring. I added a bow with a Mechanical Tassel combination. The Crackle and Messy Clear Stamps were stamped on the tag background with Archival ink. The emblem stamped behind Finn is stamped with red Archival Ink. ART in the Heart is colored with a Tombow pen and lots of white pen marks are added around the tag for contrast. I love how this turned out. Stamping and Tags have always been one of my favorite things to do. Are these cute or what??? 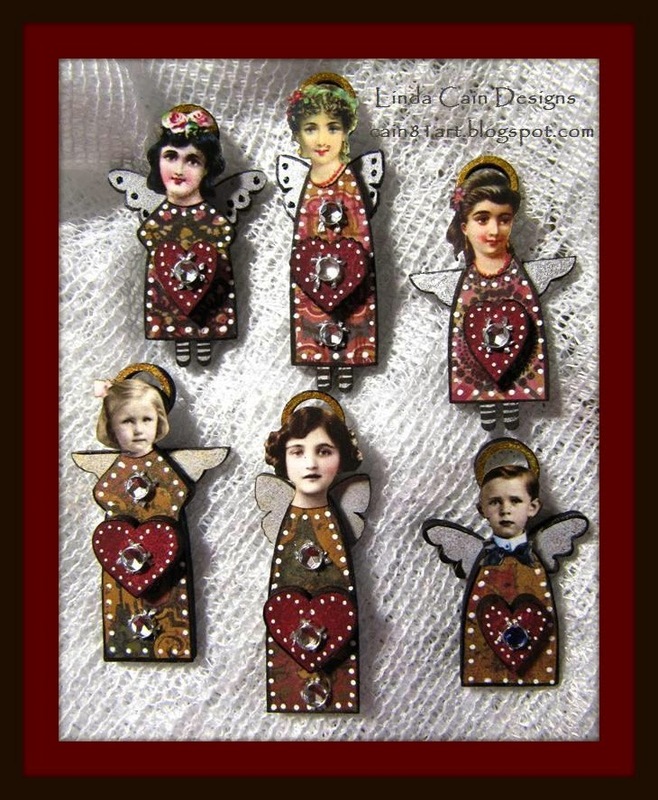 Take an after noon and create some fun little Valentine Angels. 30 MINI Fairy Doll Head Paper Cuts. The front of the Angels have been covered in colorful Vintage papers, stamped with a Doily stamp and embellished with a single jewel cut from the Faux Rhinestone Trim. The Tiny Hearts are painted and have white pen dots to decorate the edges. The backs of the Angels where painted and stamped with Black Archival Ink and Finnabair's Lace and Doily Clear Stamp. 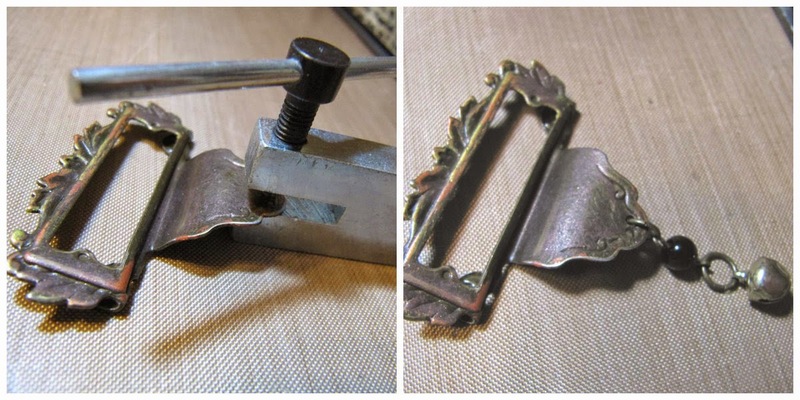 These stamps are soooooo perfect for working on these little pieces!!! So check out the links, order some little treasures from Kristin, and get to work!!! 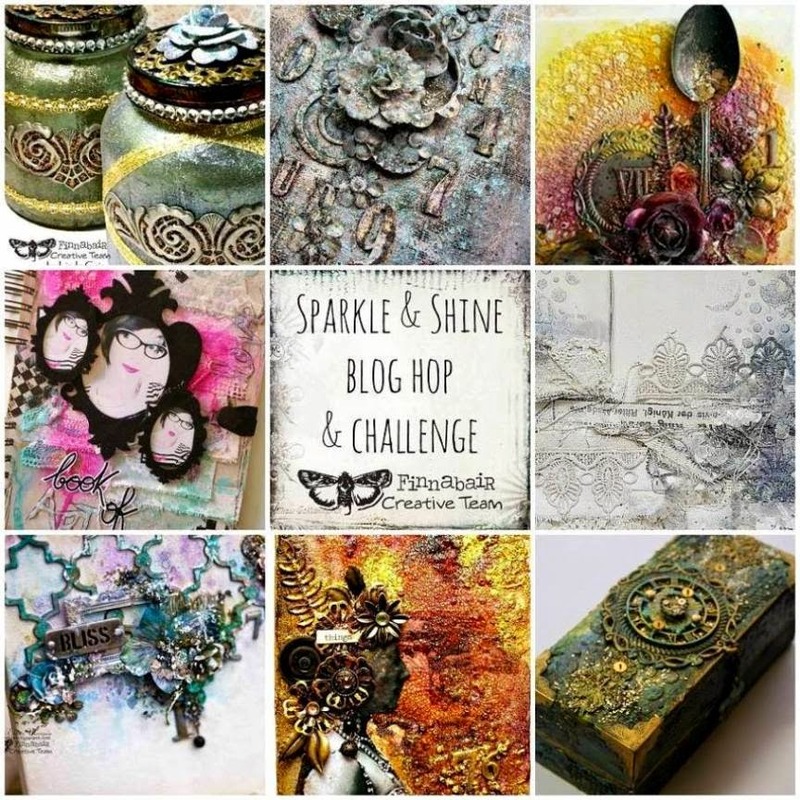 It's time for another Blog Hop from the Finnabair Creative Team!!! We've put together a wonderful group of projects for you to drool over. So get ready to be amazed! I wanted something for around the house. I keep bath salts over the tub area in my bath, and I was in need of some updating of those jars. I found 2 clear glass jars with metal lids at Hobby Lobby. 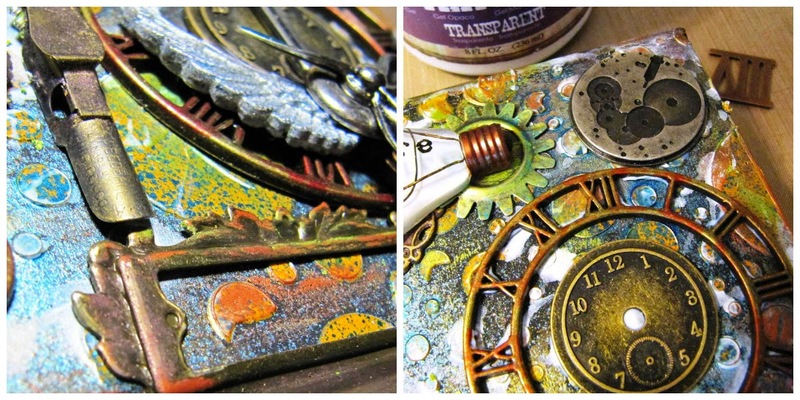 I've shown this technique before using a layer of Soft Gloss Gel, then Clear Crackle, Inks, and another layer of Gloss Gel with Art Sugar sprinkled on top. 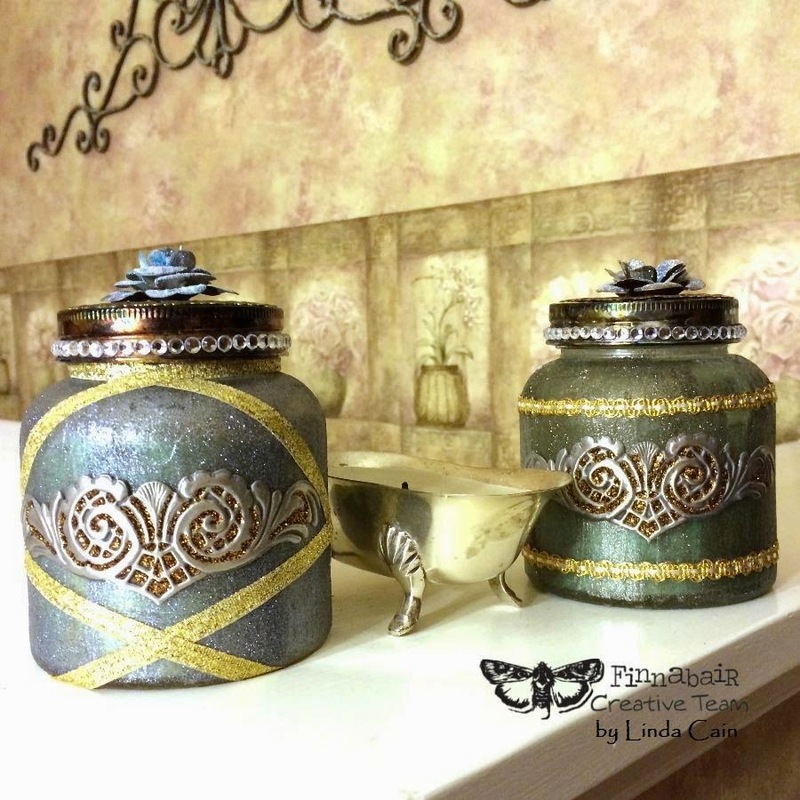 Here I used a blue inks on one jar and a blue/green inks on the other with Charcoal and Antique Silver Art Sugars. I added alcohol inks with an applicator to the lids until I liked the colors. I used Butterscotch, Stream, Rust, and Black Soot. 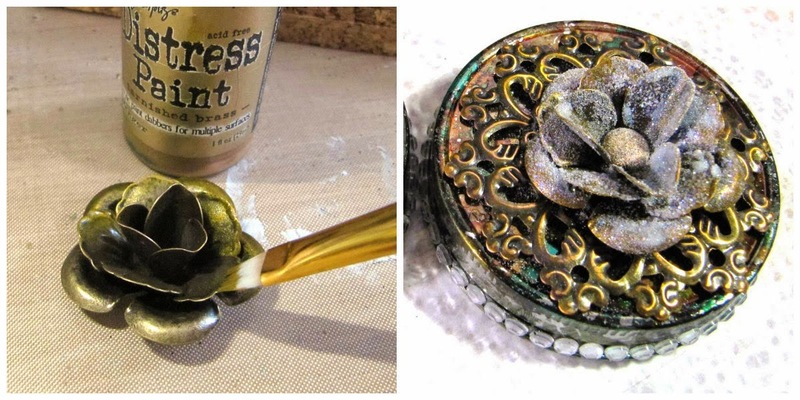 I changed the color of the Rose Mechanical with Tarnished Brass Distress paint. Then I added Ebony and Ivory Glitter and White Art Sugar over Soft Gloss Gel. The large, flat, Flower Mechanical is polished with a Detail block. Then a hole was punched in the lid of the jar to add it, and the Rose, with a brad. 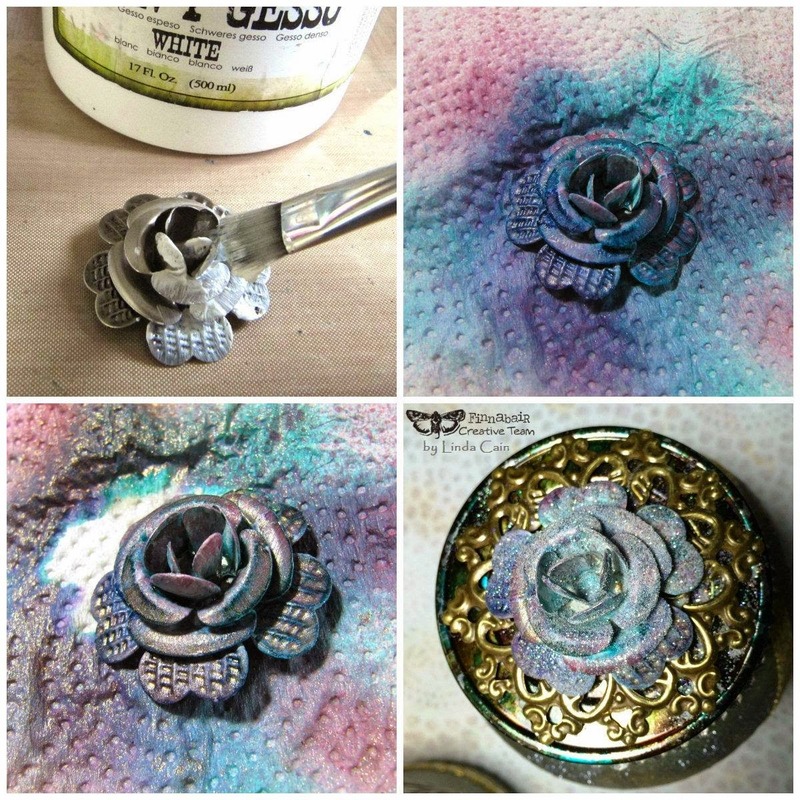 A Silver Rose is painted with Heavy White Gesso. Then I prayed with various colors of inks, then a bit of Perfect Pearls, and the last layer is White Art Sugar over Gloss Gel. Rather pretty. 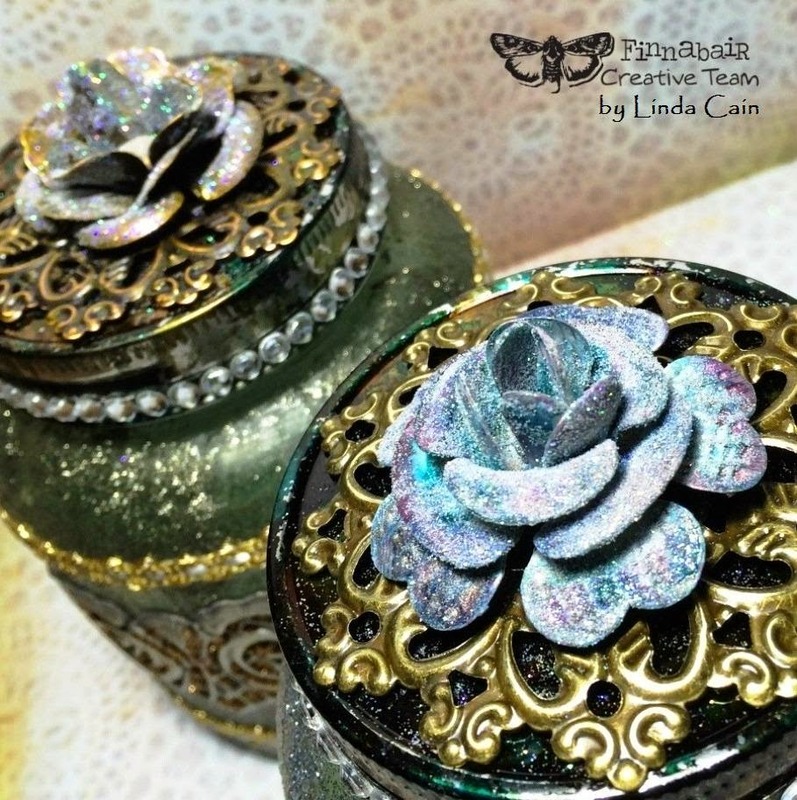 Here you can see the sparkle of the glitter on the Roses and edges of the jars. 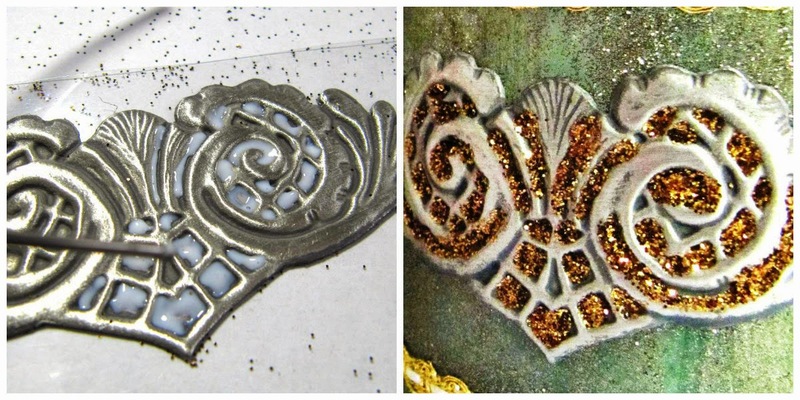 I found 2 great pieces of vintage pewter embellishments in my stash. They are very soft and pliable for bending. I added Soft Gloss Gel with the Precision Tip Applicator Bottle. It's really great for tiny spaces. 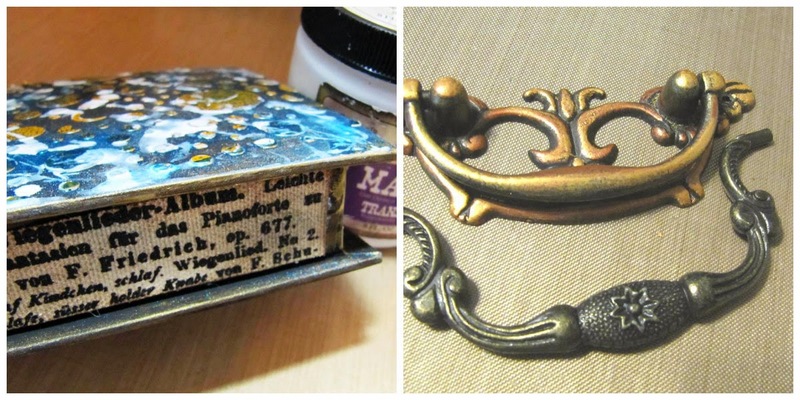 Then I sprinkled on some gorgeous antique gold Luminous Glitter. When dry they were easy to add to the front of the jars with some glittered ribbon and fancy trim. 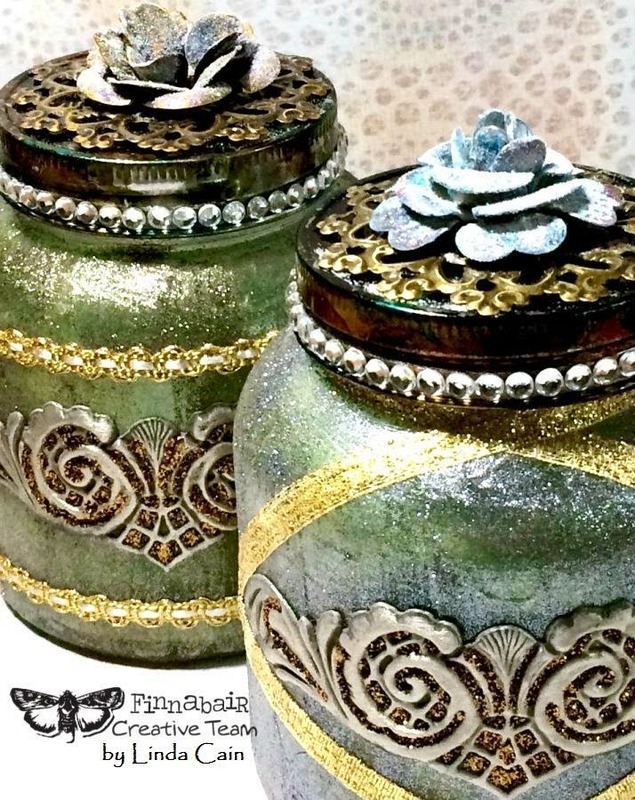 A row of clear rhinestones added a bit more glitz to the edge of the jars. When I filled the jars with blue bath powder it added a whole different color to the background of the glass. Here they are on the ledge and ready to use. And did someone say PRIZE??? YES, this is the collection of products from Finnabair for the Prize!!! We hope you'll feel inspired and ready to create some sparkle of your own! 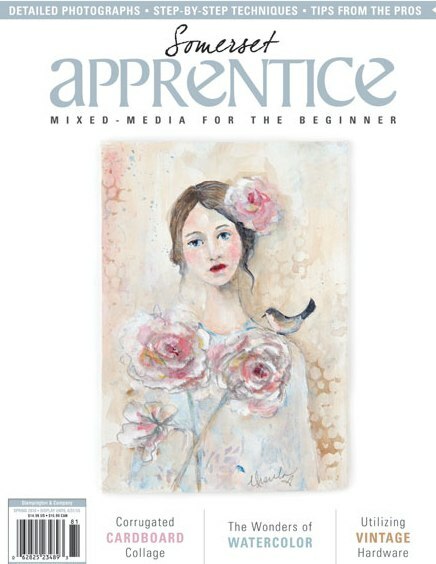 The rules of the challenge are very simple indeed - you can create any kind of project (layout/art journal/altered art/ATCs etc) and our Creative Team will vote on their favorite one. The only rule is: making it Sparkle & Shine! 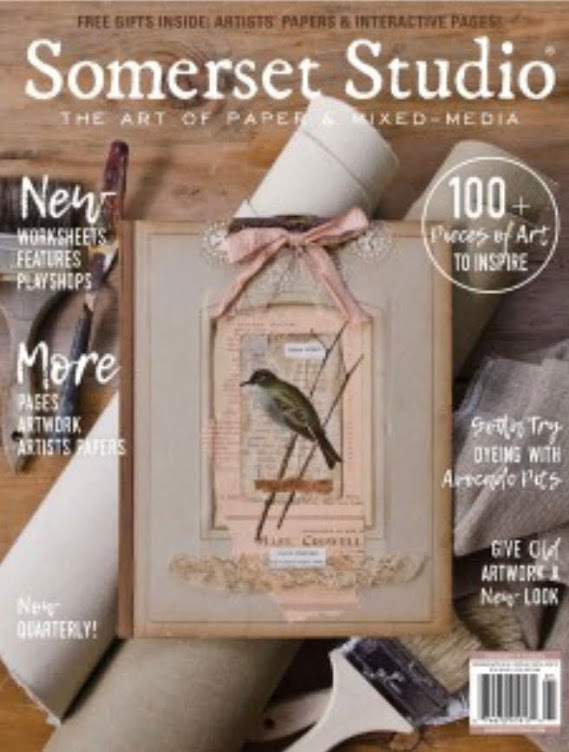 Jump to the other gals blogs in the Hop and find more scrumptious ideas to keep you busy in your craft rooms and studios, and don't forget to leave them some love! This is probably right up there for my All-Time Favorites. I really, really, love how this technique turned out on Masonite from Retro Cafe Art Gallery. 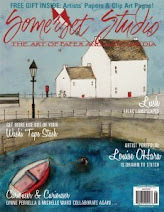 I received a wonderful box of paints and mediums from DecoArt Media a few weeks ago. After watching the brilliant Andy Skinner's demo from CHA, I decided to give it a twist on Masonite instead of chipboard or mat board. The big difference here is that the Masonite does NOT absorb the paint to create the fantastic faux rust, BUT these colors are much the same as in Andy's demo. The edges of the pieces are brushed lightly with Inka Gold and Inka Gold-Copper as well as the Heart Key. I've copied this cute vintage picture from my antique stash and found it was perfect for this Cameo frame inside the ATC Hutch Shrine - Adore. You can see a glimpse of the really cool stamped and painted interior here. This is the outside with Cobalt Turquoise, some Paynes Grey and numbers stamped with Titan Buff. Black Archival Ink is used to stamp the script stamp last. I really love the distressed and vintage look here. Here you can see the back of the Hutch that I stamped with Titan Buff and then used the glaze from Andy Skinner to "antique" it. 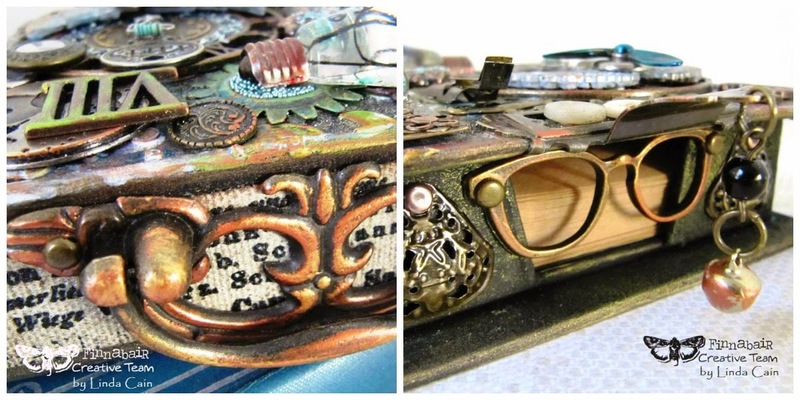 This is the Hutch insides and back using the Quinacridone Gold, Black Archival Inks, and the glaze. This shows the "before" Number Stamp side on the left, and the "after the glaze" on the right. Pretty amazing, Mr. Skinner!!! The Stamps are all from The Artistic Stamper. Thank you again for those lovely beauties! Check out the links below. These are all the different paints I used to create this. And in the little travel jar is the wonderful concoction of "GLAZE." 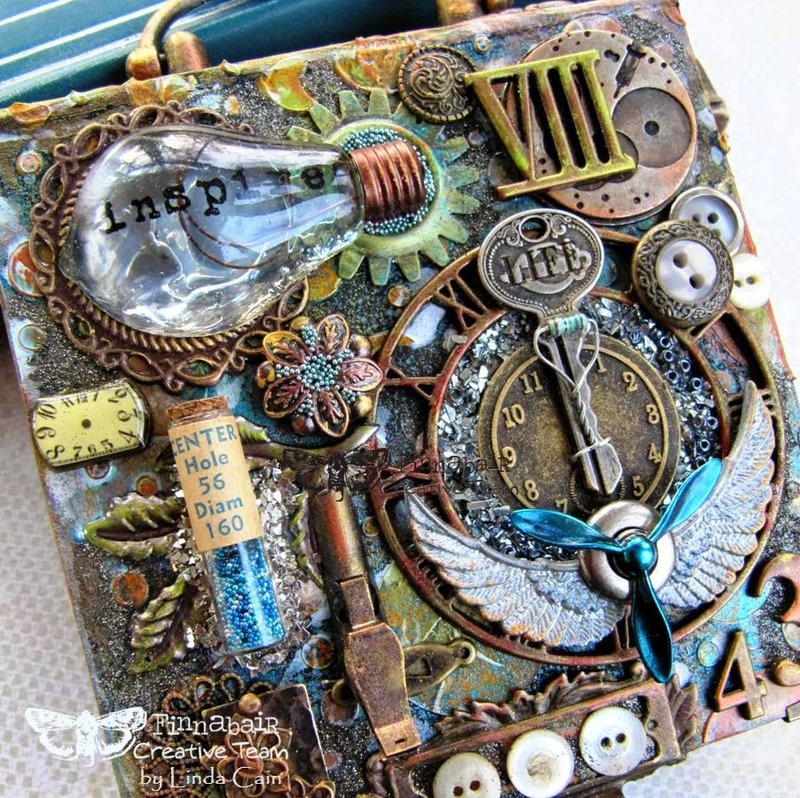 So take the time to go see Andy Skinner's tutorials on YouTube and learn to make some really awesome Vintage keepsakes with Retro Cafe Art Gallery Masonite. These are so much fun to make, and people will LOVE to receive them! they're small enough that you can make several in a sitting. I painted the Cameo with paint dabbers and glued the Heart Cut Out to the back. The Cupids are glued and glittered on top. Some glass beads with glitter make this thing really sparkle. 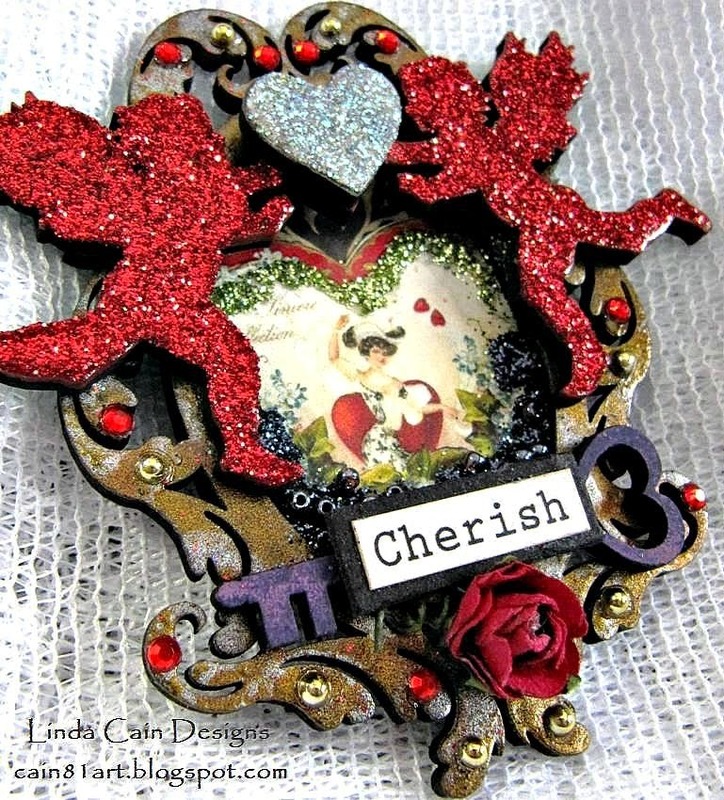 A few rhinestones, a Heart Key Cut Out, and a little Rose draw it together with the simple "Cherish" phrase. Most of the products you need are found on the links below. and get to ordering. Kristin will set you right up! 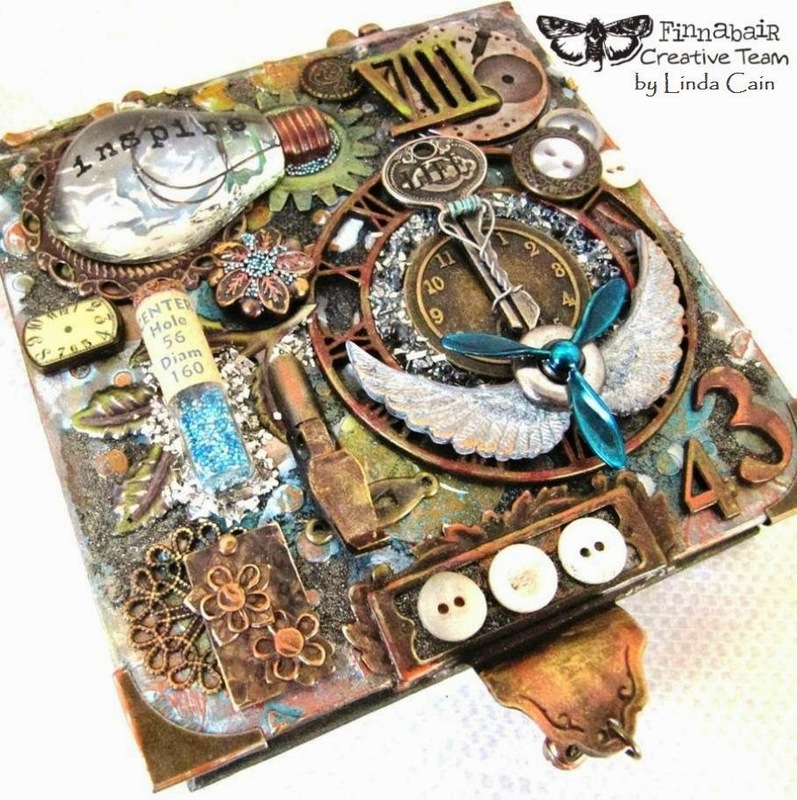 It's my turn again on the Finnabair blog for the Creative Team!!! This time I altered something I can put on my desk to jot down creative ideas that come to me for other projects. I love the glasses in the front! 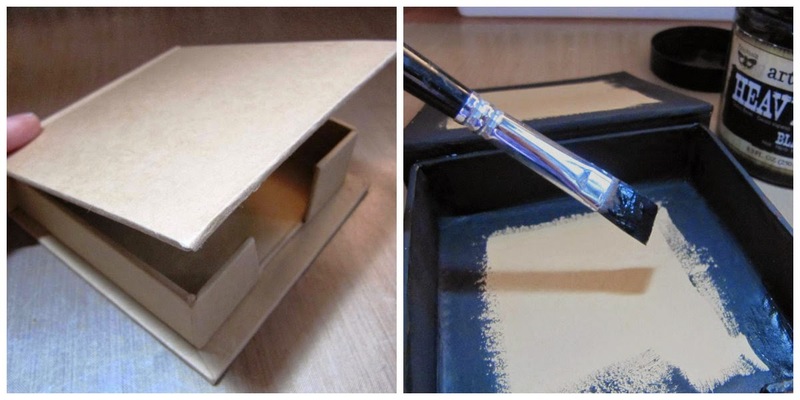 I started with a plain paper mache box that I painted with Heavy Black Gesso. I left the inside section unpainted since I'll add scrapbook papers there. I chose a heavily pigmented acrylic paint to use with the Modeling Paste. A little goes a LONG way. 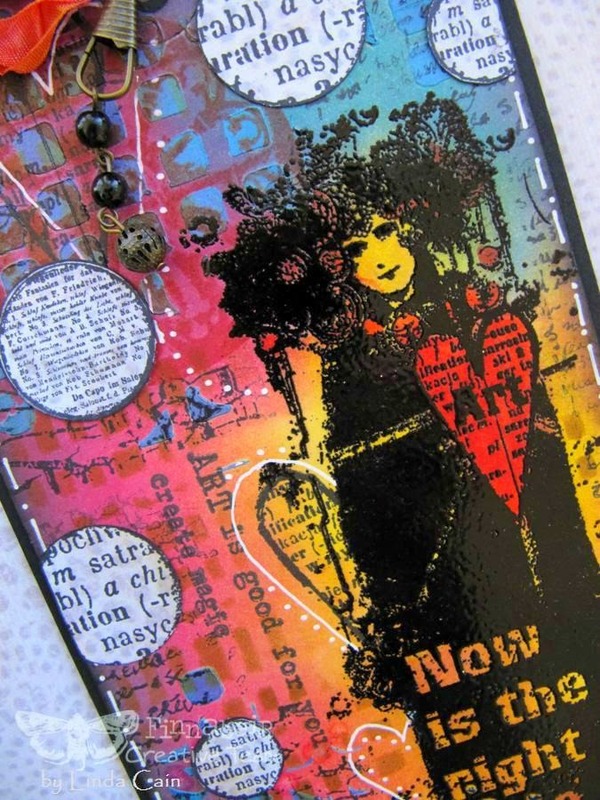 I used 2 colors and added the mixture to the box with the Bubbles stencil. Then I started to add more color. I spritzed metallic Shimmer Mists on and also added drops with sprayer removed from the bottle. LOVE the shine here! 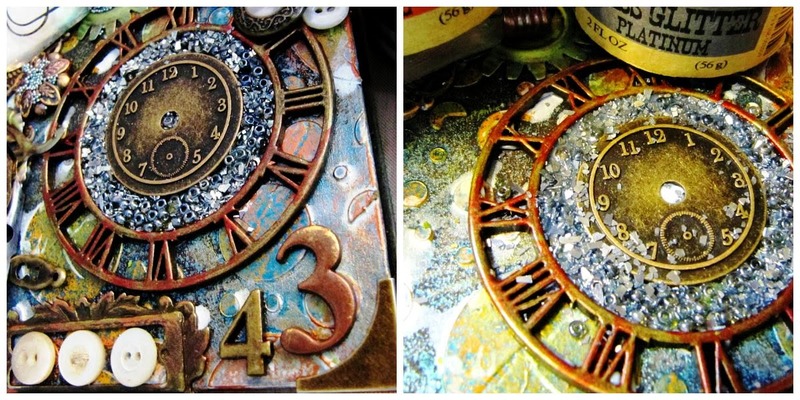 I added Ultra Thick Embossing Powder on the Small Clock Face. Then I added some Silks with a dry brush. 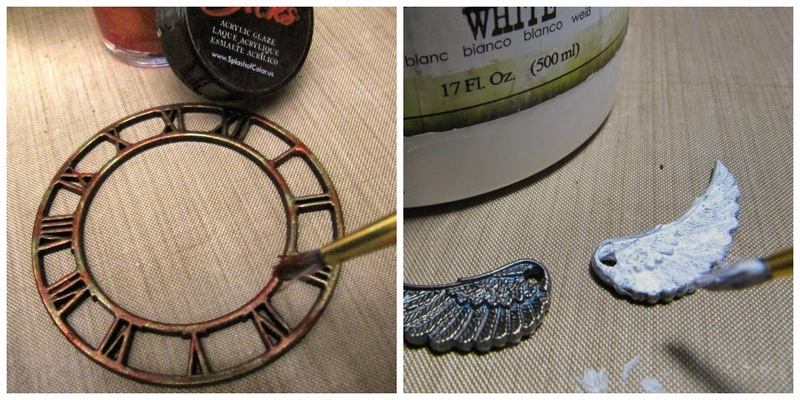 I base coated the metal wings with Heavy White Gesso and added silver acrylic paint. I started adding color to this label pull. Then I decided a Tassel would look great hanging from it, so I used my jewelry 2 hole punch to make a hole for the Tassel. I started to add more color to the background and metal elements. Then the scary part for me.....gluing it all down. I used 3D Matte Gel for the heavy pieces. For a bit of sparkle and shine, I added a mixture of Platinum Glass Glitter and Zinc Glass Beads in the clock section with Soft Gloss Gel. 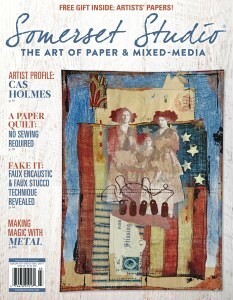 The sides and back have Newsprint Canvas strips added with 3D Matte Gel. The metal handles show the "before" on the bottom, and the "after" on the top with 2 colors of Inka Gold paste added. Makes a BIG difference. The handle is added to the back spine area with 3D Matte Gel and brads. I did the same with a pair of glasses across the front. I cut apart a Medium Flower and added pieces with copper brads. You can see the Tassel here with some Inka Gold added to it. I found 2 metal labels for the sides. They were plain silver in color, so I first added 2 coats of Heavy White Gesso with a foam square. Then I added a coat of Clear Texture Crackle and several layers of inks when dry. LOVE the aged metal look it creates!!! Put a phrase in the frame and add to the sides. 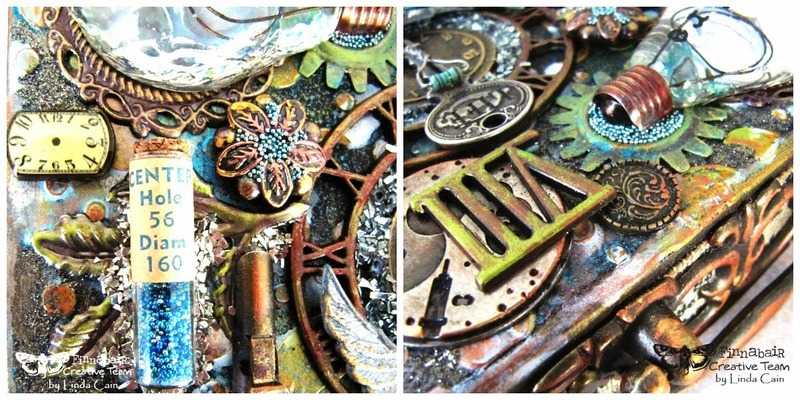 The bits and pieces get added last...buttons, a propeller colored with alcohol ink, the key with a computer part twisted around it, micro beads in a gear with a light bulb phrase, a Roman Numeral, Numbers, a Vintage Center, and Charcoal Art Sugar to fill in spaces. That color is so gorgeous. The Pendant under the light bulb and Leaves are colored with Inka Gold as well as several other Mechanicals. Sterling Glass Glitter is sprinkled around the tiny vintage bottle to help support it. When the 3D Gel dried under the light bulb it left a really cool pattern. That's it for today. 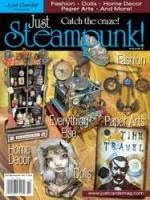 Don't forget to check out the links for products, and let me know what you think. As always, questions are welcome! Today is a bit warmer....schools were out because of the cold for the last 2 days. But hopefully some of the frigid air has moved on. with gorgeous blues and sparkling snowflakes to brighten the cold winter day. 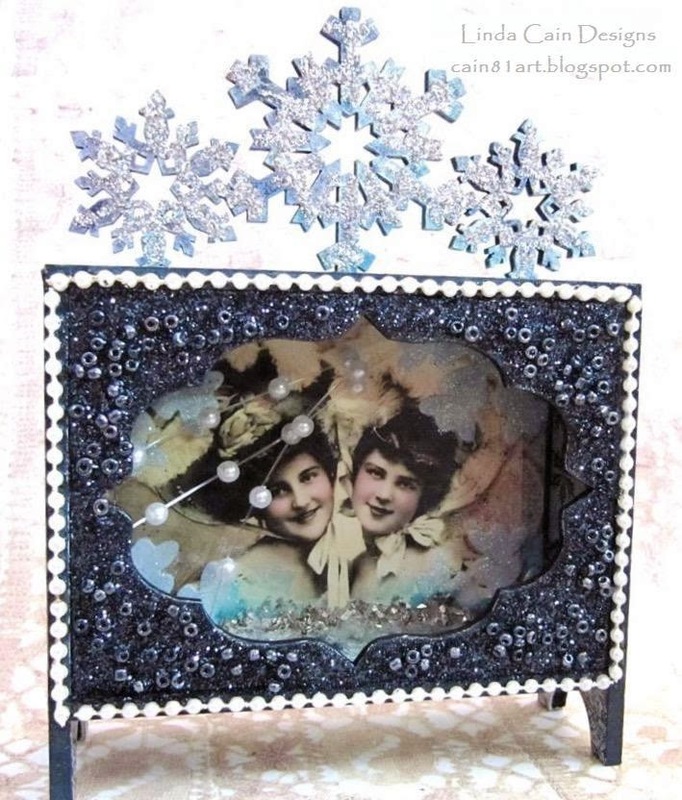 This is an ATC Snowflake Hutch Shrine from Retro Cafe Art Gallery. They are so cute. I love how the insert creates a little shadow box. I painted the outsides with Heavy White Gesso to start out. I added decorative papers to the insides. Then I stamped snowflake stamps with various blue inks. The front section is coated with Pea Coat Fresco paint. When dry I added a layer of glossy accents, and then Zinc Glass Beads with a gorgeous blue/black Ebony and Ivory Glitter mixed in. 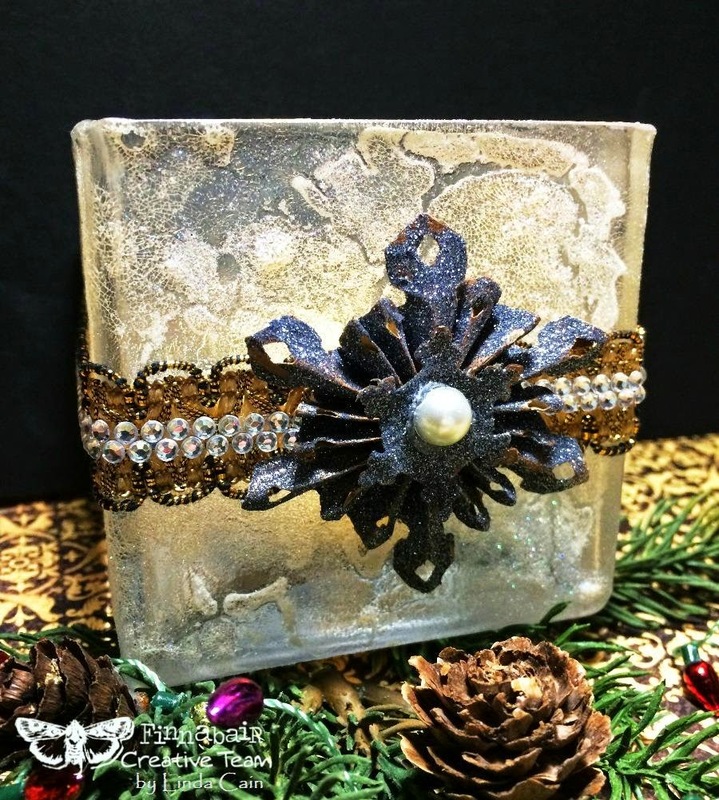 The inside has Soft Gloss Gel with Sterling and Pearl Glass Glitter around the corners. The Pearl looks like snow. The vintage picture of the Best Friends is added to the back section over scrapbook paper. I coated it with Gloss Gel so I could add watercolor pencils around the girls. Then some White Art Sugar to sparkle up the background. You can see the stamped paper in the picture above on the left. This shows the outside that I painted white first and then added South Pacific Fresco paint and a bit of water as a wash with a foam square. I really like how it turned out. The blue snowflakes really stood out on the turquoise background. The snowflake topper is painted white first and then I sprayed it with turquoise and purple sprays. 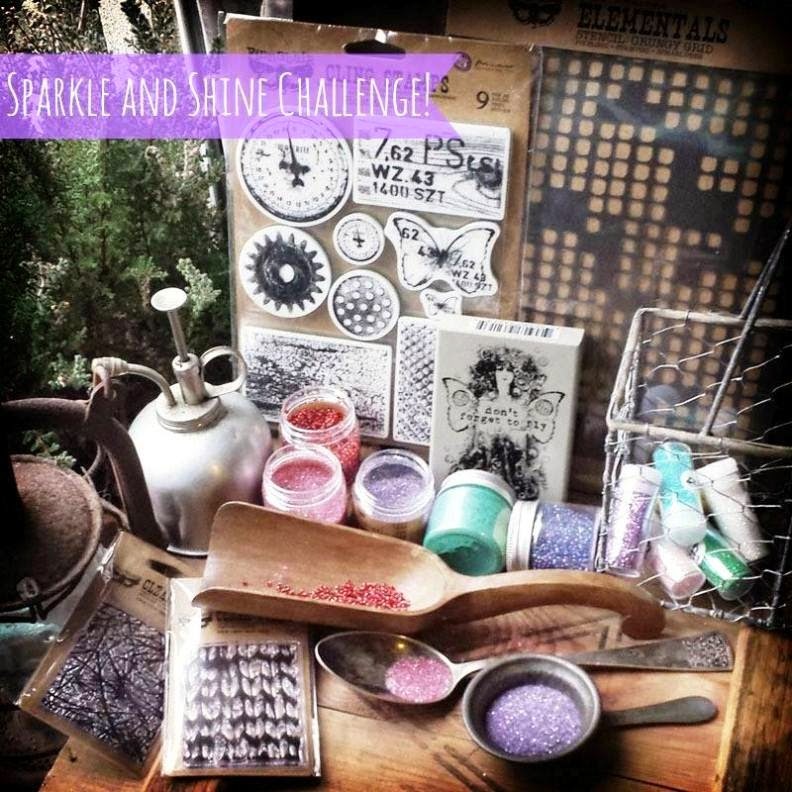 I drizzled glossy accents around the flakes and added silver Luminous glitter. I wanted the colors to come through in areas, so the sporadic glue let that happen. The last thing is to add tiny pearls around the face of the box after you've glued it all together with a small amount of 3D Matte Gel. Lot's of fun on an extremely cold, but pretty winter day here in the Studio. Two days ago was a beautiful blue-skied day, so we were out running around most of the time. Today it is 30 degrees colder and we have 4-5 inches of white powdery snow on the ground...time to stay inside and play in the Studio. Here's a fun project you can make to warm up your Winter days....if it's cold and snowy where you are. The technique is similar to the Golden Bottle, but easier. I'm telling you, this glass votive candle is REALLY easy to make. I'm so into glass and glitter right now. And it would be a perfect gift for someone special. I started with a plain square glass candle holder from Hobby Lobby. I coated it with Soft Gloss Gel, and let it dry. Then I added a coat of Clear Crackle Texture. Keep it thin so it dries faster. Here it shows it's still wet in a few spots. 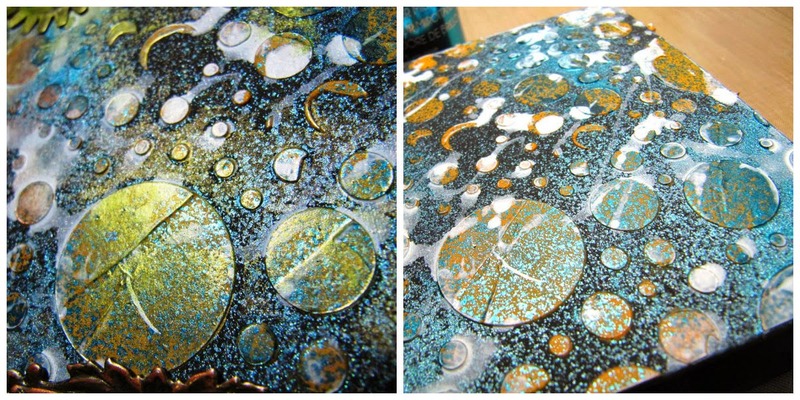 You can sprinkle Art Sugar in spots that are thicker and still aren't dry. Or add a bit more Soft Gel here and there and sprinkle glitter again. Here you can see how this GORGEOUS White Art Sugar reflects with bits of turquoise and blue in the light. It's even more impressive in person. See the crackles on the glass in this close-up shot??? 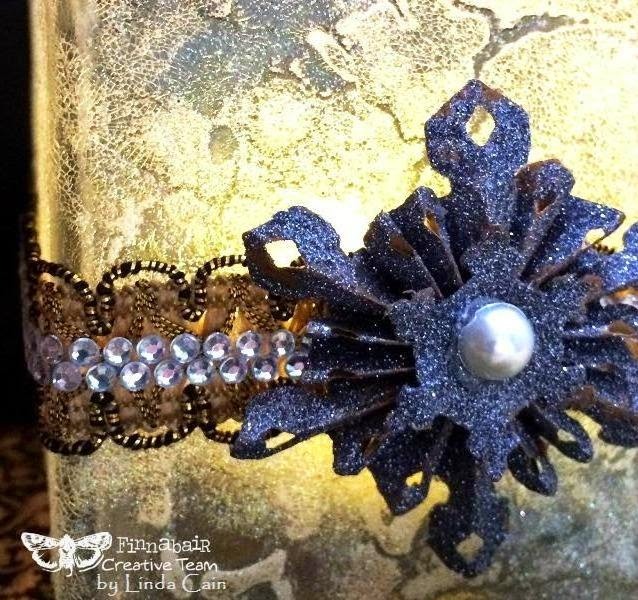 This detail shows the larger of the Mini Snowflake Rosette die that I made by painting Copper Crackle Texture Paste on the paper cut first, and then adding Antique Silver Art Sugar over Soft Gloss Gel. 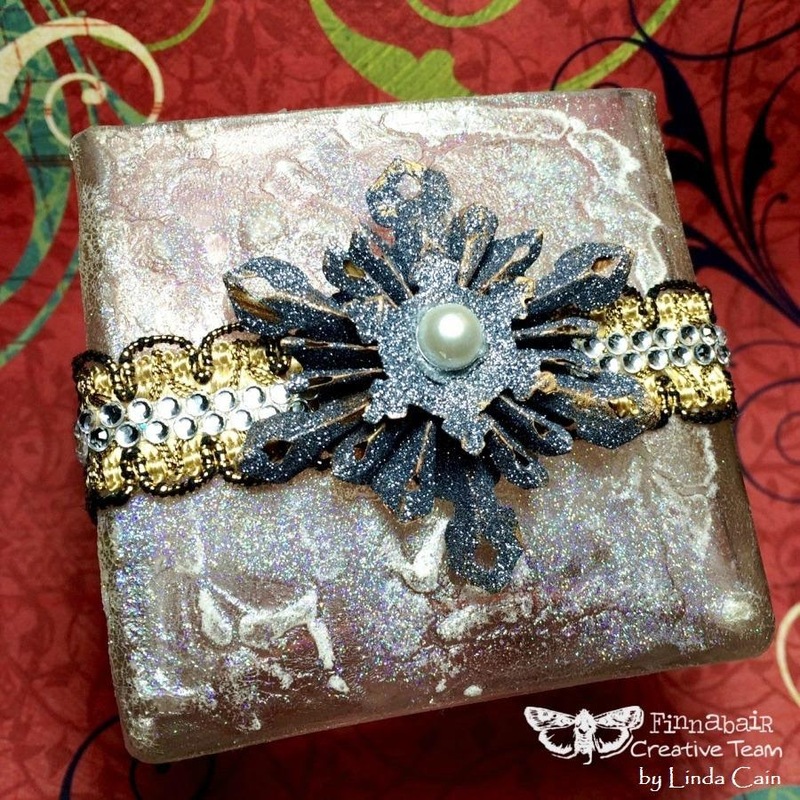 The Gold Trim is added with 3D Matt Gel and the row of adhesive clear rhinestones go on top of the trim. A large Pearl in the center of the Snowflake is added with hot glue. I LOVE how the crackle shows up with a small battery operated tea light shining through the holder. It totally changes the color of the piece. This shows you how it looks without the tea light. Totally different in the daylight. 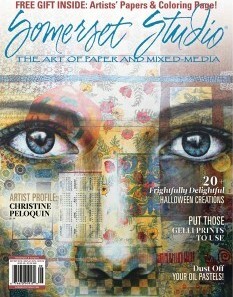 There is NOTHING like ART SUGAR...I tell ya, you'll be amazed! So all in all, this is a pretty quick and easy project to make that will warm your heart and those of others. Soft Gloss Gel, Clear Crackle Texture Paste, Copper Crackle Texture Paste, White Art Sugar, Antique Silver Art Sugar, 3D Matte Gel. Sizzix Mini Snowflake Rosette, Decorative Gold Trim, Double Row Adhesive Rhinestones, White Pearl, Battery Operated Tea Light, Hot Glue Gun, Vagabond Die Cutting Machine, scrapbook paper.